Batten Down the Hatches ~ STORM APPROACHING! For the last couple of days we’ve been listening to the weathermen and women predicting a 100 year storm, the Perfect Storm! Hurricane Sandy is on its way up the east coast and on target to collide with two other frontal systems from the northwest. Heading toward us in Virginia, I thought I better batten down the hatches! I got out the bungee cords and tied down our deck furniture and Weber grill. Our neighbors are out of town so we did the same to their deck furniture. We’ve been to the store and stocked up, preparing for a power outage. We have our flashlight ready and an ample water supply. Plenty of pet food. This could be the big one! It all made me think of my painting Storm Approaching! It is part of our personal collection, one that I’d hate to part with. 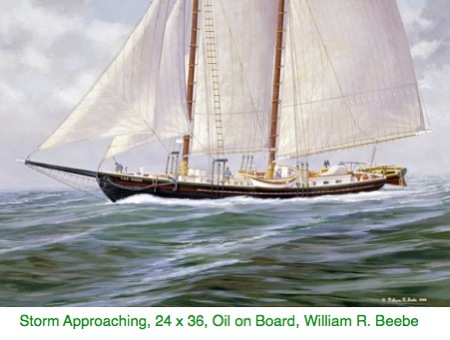 The schooner is the J & E Riggin, a historic wooden schooner whose port is Rockland, Maine. It was painted glassy smooth on board. When I was painting it I was thinking of an approaching storm, darkening skies and wind picking up, filling the sails. Glassy water that will turn violent in a matter of minutes. I can’t imagine being out on the water in a two-masted wooden schooner with the perfect storm heading at us. The J & E Riggin has survived many a storm. Countless schooners and sailors have not been as lucky. As we await Hurricane Sandy’s arrival, we hope somehow it spares all sailors and landlubbers alike. Good luck to all in the eye of the storm! This could be the big one! Batten down the hatches ~ there is a storm approaching!!! !